Will Leschber looks into The Future. The Neo Futurists are coming. They are preparing to hit the Bay Area in the near future. But, who are they? And more importantly does their pastiche, mash-up theatre structure serve a purpose? One could also ask this of Waking Life, the unconventional 2001 indie film by Richard Linklater. Let’s begin at the future. I was fortunate enough to catch a performance of The Neo Futurists’ “Too Much Light Makes the Baby Go Blind” in Chicago last week. They are self described on their website (neofuturists.org) as “a collective of wildly prolific writer/director/performers who create: Theater that is a fusion of sport, poetry and living-newspaper.” Although this company is a new revelation to me, they have actually been around for 25 years. The company name evokes art in transition; Something that flagstones a bridge between theatre today and audiences of tomorrow. Their mission is to create “work that embraces those unreached or unmoved by conventional theater inspiring them to thought, feeling and action.” This postmodern approach to theatre combines improvisation, short-form timed theatre, unconventional entertainment structure, narrative dance/movement and other performance forms as a way to provide a new kind of theatrical experience. The rundown looks like this: the audience receives an order menu of 30 play titles as they enter. If you are picturing Chinese take out, you are on the right track. When the performers shout “curtain!” throughout the night, anyone in the audience is invited to shout back a number 1 thru 30. The first number a performer hears, that play is up next. The goal is to get through 30 plays in 60 minutes. Each night is different from the last. Nightly the order re-shuffles and new plays are written and swapped in each week. The structure itself and the extensive possibilities are exciting. It is Jack of All Trades Theatre with all the positive and negative connotations. In that, I mean the Neo Futurists provide scatter gun entertainment that hits in the keys of Comedy, Drama and the myriad spaces between. I do wonder if the parts, in this case, are more than the sum. Of the 60 plays, I can remember a mere handful. Yet, I enjoyed them all. This eclectic theatre satisfies so many tastes in a structured form that doesn’t allow the performance to master any one. Herein lies the purpose and also the frustration. I was not as moved as King Lear nor did I laugh as hard as Noises Off. However, in a third of the time, I laughed and felt empathy for honest connections and was wowed by breakneck athletic theatre. That’s the point: shotgun entertainment. The target audience will be hit in one way or another. Certain parts struck me. Different part may strike you. I found myself thinking about and talking about the performance days later. This for me is a benchmark of essential art. Something that stays with you. Something that isn’t easily shaken off. While I wasn’t blown out if my chair in awe, I am eager to return and pick up more pieces. 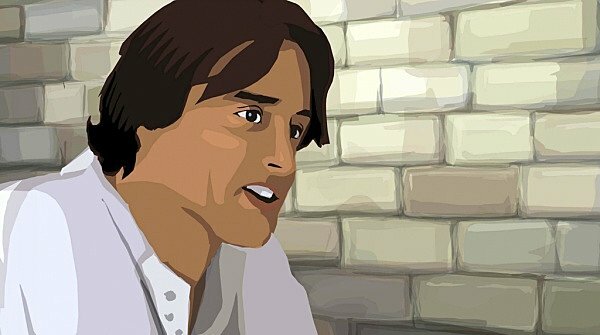 Like the piecemeal form intrinsic to Neo Futurist theatre, Richard Linklater’s 2001 film, Waking Life is told in vignettes. Genre is flipped about and narrative storytelling falls to the brief whimsy of shifting dreams. Our lead character, played by Wiley Wiggins, travels through a dreamscape in which he alternately interacts with or simply observes others in omniscient third person. Wylie watches psychiatrists discuss the purpose of love. He witnesses the heated rant of an overly political cab driver with a megaphone. He discusses purpose and identity in our waking lives and whether we sleep away our lives to only live truly in our dreams. He is told the last words of Søren Kierkegaard, the Danish philosopher and theologian who on his death bed said, “Sweep me up” and Wylie wonders whether his current sleep is eternal. Will he wake? How linked are we all though common experience and reincarnated dreams? Not only does Linklater play with story structure, he plays with the way the film is visually conveyed. To further emphasize the unstable dream state of on main character, Linklater filmed live action and then animated over the top of that. This process is called Rotoscoping and although it has been around for almost a century, Richard Linklater is the first director to use digital rotoscoping for an entire feature length film. The characters float through this shifting foreground of vivid dream creatively matching form of storytelling with content within story. Structurally the New Futurists and Waking Life operate in a similar way, separate pieces creating a larger whole. The difference lies in tone. The Neo Futurist production “To Much Light Makes the Baby to Blind” has parts linked by structure but is not unified in tone. Waking Life uses structure to enhance the story and layers on a unifying tone that echoes a searching philosophic tone rounded in uncertain melancholy. Both are unique in the best way possible. The film and theatre piece attempt to forge an experience with irregular, eclectic building blocks. The chances taken are purposeful and ultimately elevate the smaller parts to a better whole. The goal is to provide an uncommon experience instead of a conventional narrative. The Neo Futurists offer an intelligent, interactive, sprinting-fun experience sprinkled with topic musings. Waking Life offers a meandering and pensive stroll down a dream lane that looks at “life and how we perceive it” (Wiggins). If you are looking for something different, you’ve found it. Look for the San Francisco debut of the Neo Futurists in the near future. And find Waking Life to for digital rent or purchase on Amazon and Vudu. Logo-home-header. 2012. Photograph. neofuturist.org, Chicago, IL. Web. 22 Oct 2013. Waking Life. 2001. Photograph. Walkerart.orgWeb. 22 Oct 2013. <http://www.walkerart.org/calendar/2011/waking-life>. Wiggins, Wiley, perf. Waking Life. Dir. Linklater. Fox Searchlight PIctures, 2001. Film. 22 Oct 2013. This entry was posted in Uncategorized, Working Title and tagged Neo Futurists, Noises Off, Richard Linklater, Too Much Light Makes the Baby Go Blind, Waking Life, Will Leschber, Working Title. This was a great piece to read the week that I am working on two one-minute plays for the San Francisco One-Minute Play Festival, coming up December 14 and 15 at Thick House! 50 Bay Area writers will be contributing one-minute plays that, taken together, will serve as a reflection of the Bay Area theater community in 2013. I’ve participated in the One-Minute Play Festival for the past two years and it’s always interesting to see how the different parts interact with one another and whether they create any kind of whole. And it’s great that the Neo-Futurists will soon be doing this kind of thing in our city every single week! It is because of you this blog turned out at all. I didn’t know the Neo Futurists were heading to the Bay and a little birdie told me you had not only auditioned but had scored a space in the ranks!! Wahoo!! Congrats… and thank you for inspiring this blog mash.